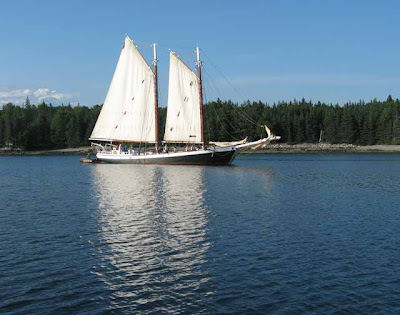 Although the sky was clear with full sun, there wasn't much wind so we motored to Boothbay. I had called ahead last week to reserve a mooring for the Labor Day weekend and when we arrived, the harbormaster said he was booked solid. 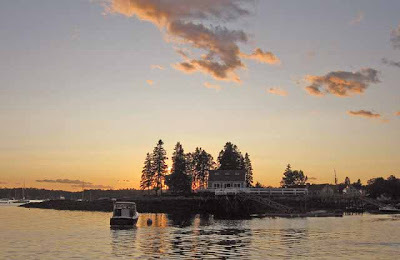 Traditionally, the summer season ends in Maine on Labor Day so we expect a great exodus. In fact, there was a steady stream of boats headed south with us today with some going to Boothbay and others for points further south. However, it's still very warm, we're wearing knit shirts still as we walked along the town. 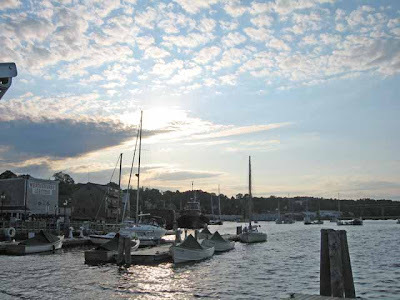 Boothbay is full of shops, much more so than Rockland. The main focus here is on the tourists although there's still lots of lobster pots to avoid on the way in and out! We ate at Kaler's again which offers good food at reasonable prices, we had fried clams - pretty good but not as good as Lenny's. 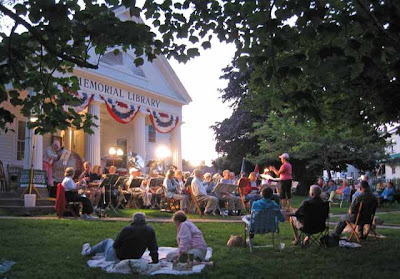 After that it was off to the lawn of the town library to listen to the local band. The best that can be said is that there were enthusiastic. We'll explore the area for the next few days and pick a weather window for our trip south. 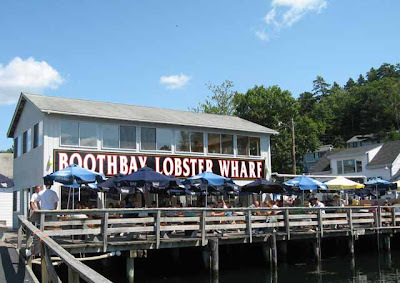 Boothbay is big enough to occupy us for several days! It was a clear, sunny day and I went to the Atlantic Baking Co. for breakfast goodies. If you're ever in Rockland, be sure and stop by the Atlantic Baking Co, it's right on main street. It's famous in the area for outstanding bread and other products baked fresh every day. The bread is the best I've ever had. This morning I bought an assortment of breakfast breads, all delicious. 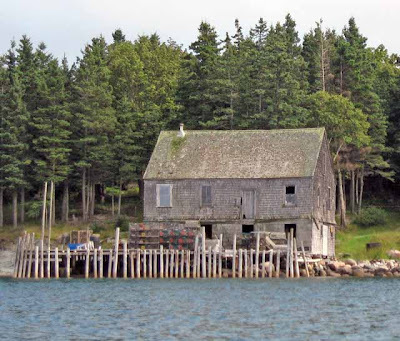 After Ann went with Leathem to the local Hannafords for supplies, we said our farewells to the Mehaffeys and pushed off the dock, headed for Maple Juice Cove. 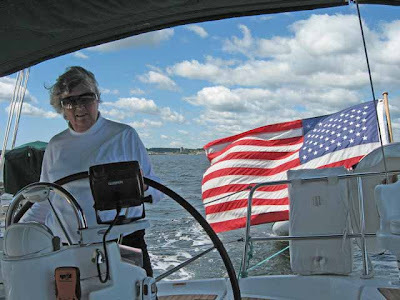 We sailed out of Rockland Harbor but then the wind died (after all, the wind god left in Mehaffey's car) and we had to motor the rest of the way. Although the lobster pots are somewhat thinner this year overall they are as numerous as ever between Rockland and Maple Juice Cove! 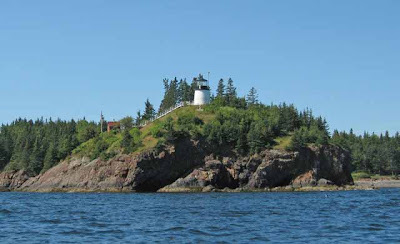 Without fog, the Owl's Head lighthouse is clearly visible. 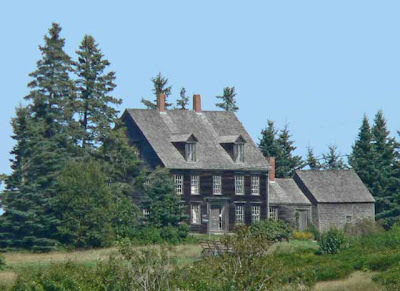 Once anchored, we admired the original house that Andrew Wyett painted in "Christina's World" (see photo). It's clearly visible from the cove. We saw the original painting in MoMA in New York City, it's one of the most famous paintings in the world. The house is now a museum open to the public but we had no access to it from water. 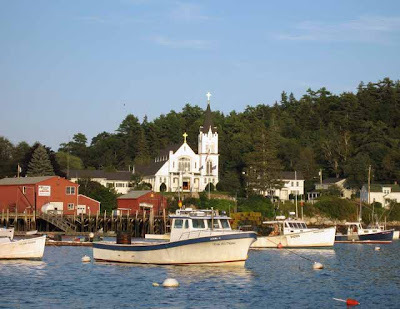 On to Boothbay tomorrow. After the front came through, the skies cleared, full sun came out in the morning and the winds were still with us. It was a little chilly at 55F so I ran the heater to warm up the cabin. However, with the full sun up, it warmed up outside rapidly. We cast off and headed south with the wind directly behind us out of the harbor, about 15 to 20 kts. We put out a reefed jib and made 6 to 7 kts. Once we turned the corner and headed directly south we put up more sail in a broad reach for the next 20 miles. 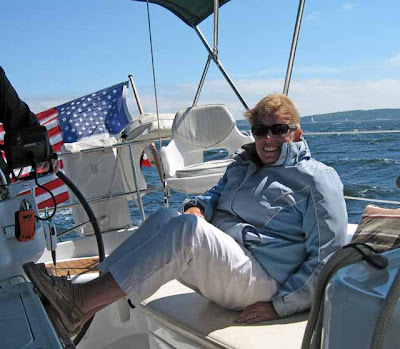 Ann hit 8.5 kts on the GPS with averages between 7.5 and 8.0. We all took our turns at the wheel to try matching the 8.5! We made 8.0 to 8.3 in the gusts and then settled back to 7.5 in a steady wind. There was not a hint of fog and it seemed like you could see forever, in fact, it seemed like a crisp fall day which I suppose it was for Maine in late August. We could see that it was time to head back home, summer was coming to a close in Maine. 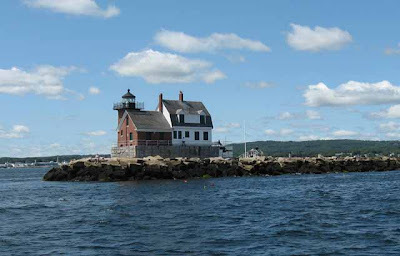 The photo is of the lighthouse at Rockland on the mile long breakwater. 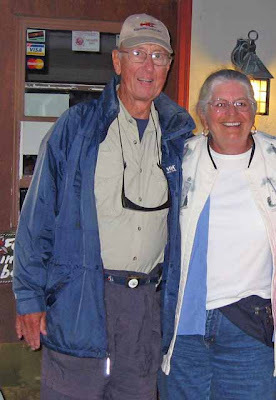 First though, we had dinner at Peter Ott's to celebrate our 41th anniversary. They take great care with their food, everything is always good. Plus, they had a salad bar with an excellent selection. Afterwards we walked by the harbor as the sun set admiring the windjammers and all the boats. A cold front was due to come through with associated showers and high winds with fog so we spent another day in Belfast. I used the day to wash down the boat and do some genset maintenance. Although there were some brief showers and dark looking clouds, it wasn't as bad as predicted on the Morning Lies. Nevertheless, the boat is now clean and we're headed for Rockland tomorrow which will start our return trip via the Maine coast back to Poughkeepsie. 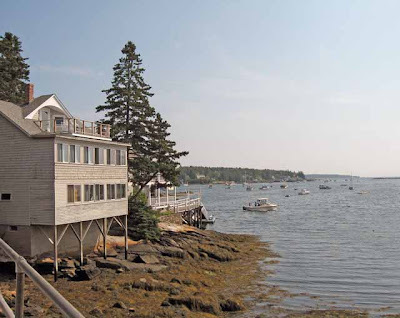 We'll stay over in Boothbay until we get a good weather window for the Jewell Island to Portsmouth hop. 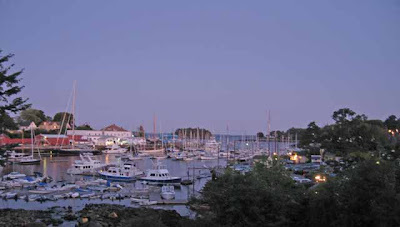 The Weathervane Restaurant is visible in the photo at the extreme left and you can see the I95 bridge at the far right. The sun came out and warmed the cockpit but then the clouds came. However, we had enough wind to sail out of the anchorage towards Belfast. The radar showed showers all around us but none hit us. As we turned the corner to head north the wind dropped off to less than 5 kts so we turned on the iron genny until we reached Islesboro. The sun came out again and with it came wind, about 10 to 15 kts to push us north. 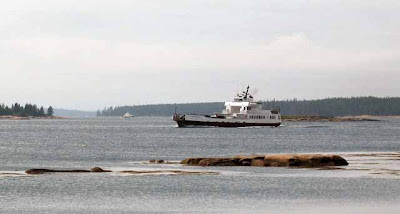 As we rounded the northern tip of Islesboro we noticed several boats severely tipped over beyond the point. One turned 180 and headed back to the lee of the point and less wind. Humm, perhaps we ought to reef more. I pulled in the jib and let main leeward but as we cleared the point of land, the wind hit us like a sledgehammer. I have never put the rain under on this boat but we came close. I headed the boat into the wind and the crew worked together to pull the jib in to the most extreme reef point and the main in so only 1/6 was showing. Pointing back towards Belfast, I saw the GPS hit 8.1 kts several times with the average around 7.5 kts which was amazing to me given the small sail area we were carrying. Every so often, we would get splashed in the cockpit from the waves coming up the bay as we headed across it. However, we were sailing in control and the boat was steady on course. 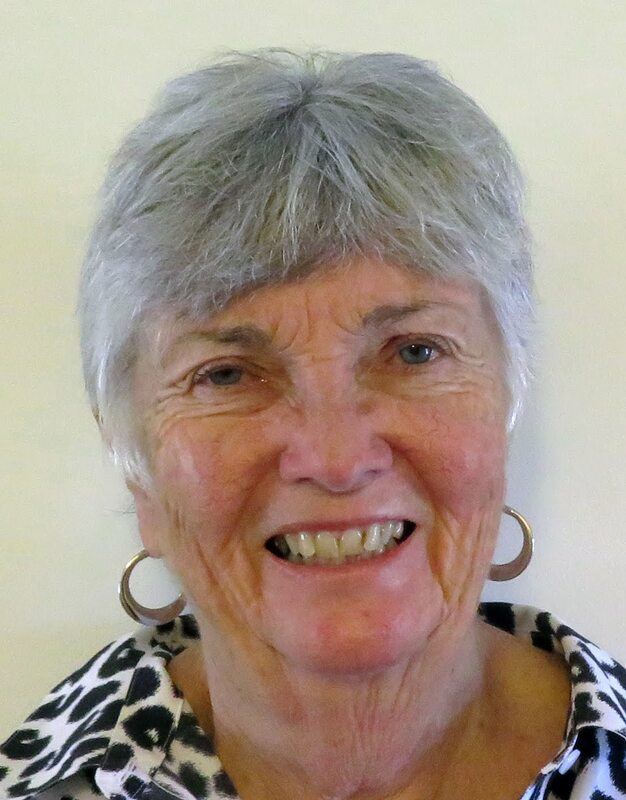 That's Ann Mehaffey in the photo. In Belfast we picked up a dock and relaxed from out sail. 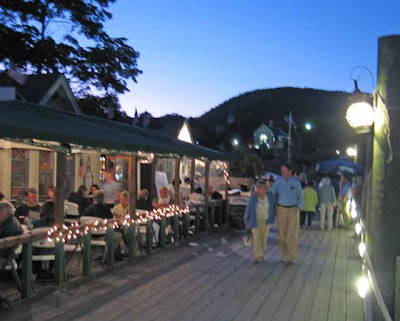 Later that evening we had a lobster dinner at the Weathervane restaurant near the dock, nice. Once again (ever since the Bunches left...) the morning was bright and sunny with no fog. We already had a good breeze out of the southwest. It was time to explore the island so we dinked in at low tide. 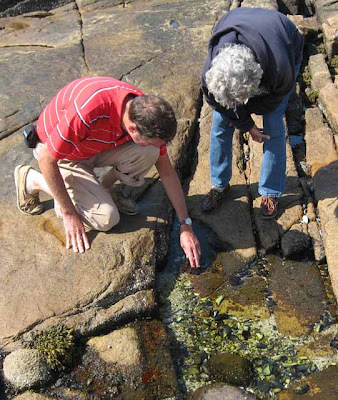 Everybody was fascinated with the tidal pools and the life that was teeming in them. Leathem was especially interested and we spent over an hour examining every pool. We initially headed towards Wreck Island but the wind was on the nose so we veered off and went through Eggemoggin Reach with the wind on a broad reach. We mostly averaged 6 to 7 kts and we sailed for the next five hours! 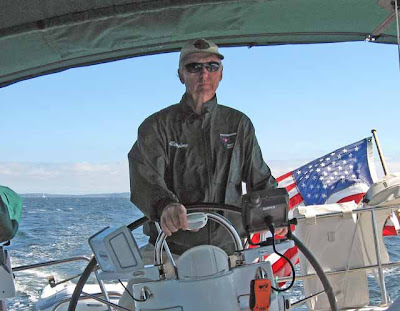 Penobscot Bay is protected from the Atlantic waves and rollers so the water was flat but we had winds anywhere from 10 to 20 kts, great! 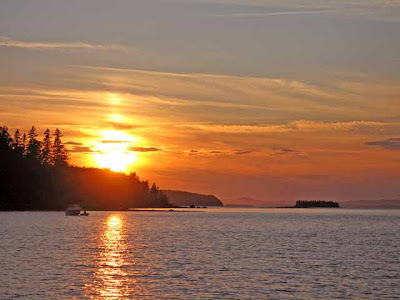 It was the type of sailing that makes you want to spend every possible day in Maine, clear air, full sun, warm winds, flat water, fabulous scenery and a quiet anchorage at night to admire the sunset over wine and dinner! The day broke with full sun again, no fog. In fact, we've seen no fog since the Mehaffeys arrived! We had breakfast in the cockpit again and then dinked to the island for some hiking. 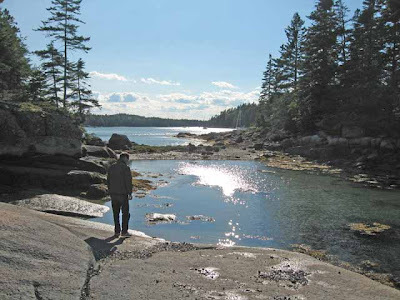 We had met the owner previously and we were invited to take the hiking trails "at the end of the anchorage". Well, finding the start of the trail was not so easy. We went along the entire length of the beach before returning to the dink only to find the entrance point close to where we started out, marked by a distinctive green rock. We found the trail marked by blazes and easily followed. One trail led to Porpoise Point but ran out of time. Returning to the beach we decided to dink out to Porpoise Point to see what we missed by not going to the end of the trail. Once in the area, we noticed a porpoise (!) rolling nearby. We gave chase for awhile but then decided to just cut the motor to see what the porpoise would do. Well, he was interested and came to inspect us! He passed right under the dink three times! We could see him clearly in the water rolling on his side so he could get a good look out of one eye at this strange invader. I made a movie with my camera but it's 220 Mbytes. Regardless, I will load it on the internet for anyone interested to download when I get an internet connection allowing such an upload. The movie shows the porpoise rolling around the boat and passing under the dink multiple times, great! Finally, we left the anchorage under power since there was only 5 kts of wind. We motored down Eggemoggin Reach but at the end of the reach the winds picked up and we sailed the rest of the way to the Opechee Island anchorage. On the way we passed several windjammers. There were two on opposite tacks when one of the windjammers did a 180 and raced the other one for several miles, overtaking his rival. 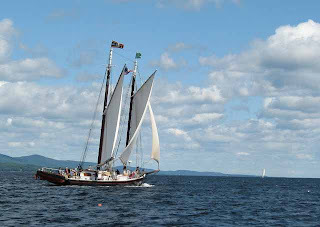 It was a grand sight with two windjammers in full sail! We had full sun the entire day, such good weather! When we were filling up at Billings Marina, I helped a man with a small powerboat come into the fuel dock. As he was filling up, we started talking and he introduced himself as the owner of Pickering Island and invited us to come by to try the hiking trails. With that invitation, we headed for the anchorage this morning. The day broke with bright sunshine and a warm cockpit where we ate breakfast. There wasn't a lot of wind but we had 5 to 8kts, enough to drive us north. We stopped over at Barred Island with the osprey nest for lunch. The youngster was still in the nest (we were there last week) and being fed by the parents. 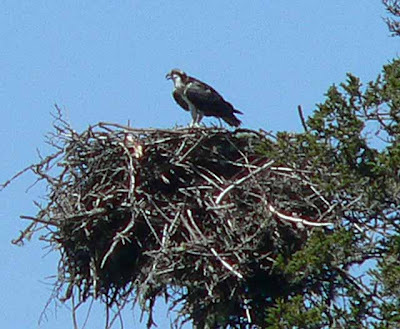 We snapped a photo of the young osprey. After lunch and lots of photos, we resumed our sail north to Pickering. We anchored off by our self. There is something about the "herding instinct" in anchoring. Boats seem drawn to your boat even though there's lots of room in the anchorage. One came in and anchored right in front of us! I stood on the bow and glared, a dinghy came over from the boat and a discussion ensured about how close they were. They finally reanchored about 70 feet in front of another boat (but far from us)! All this in an anchorage about 1000 feet square at least. 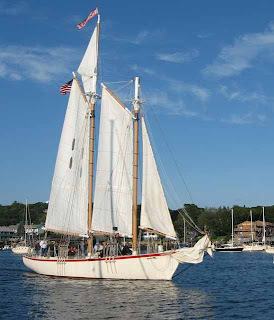 We had grilled chicken as the sun set in a rosy sky and a windjammer cruised by in Eggemoggin Reach, beautiful! What a clear day! No fog, lots of wind, not much wave action. The wind was out of the west at 10 to 20 kts with gusts to 27 kts! It was down in the 50's in the morning but was 70 when we left for Seal Bay. First we had a blueberry pancake breakfast with the native blueberries brought by the Mehaffeys. We had the main all the way out but had to reef the jib and sailed across Penobsco t Bay at 7 kts. Entering the Fox Island Thorofare, the wind piped up to 27 kts and we had to further reef the jib and pull in the main but still sailed along at 6 to 7 kts. We didn't put the engine on until right in front of Seal Bay and found a good spot in the inner harbor protected from the west. 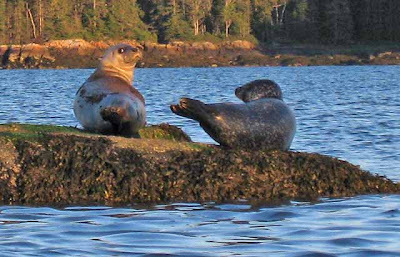 After grilling hamburgers with fresh tomatos on the side from Mehaffeys' garden, we went seal watching on the nearby ledges. The seal obliged and lots of digital film was expended. 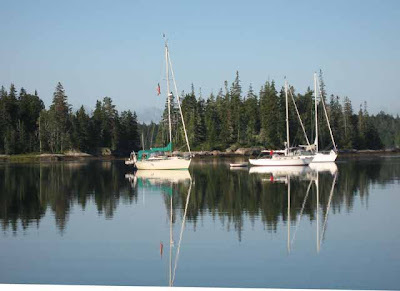 Now the water is calm and we're looking forward to tomorrow's sail, a west wind to Pickering Island. 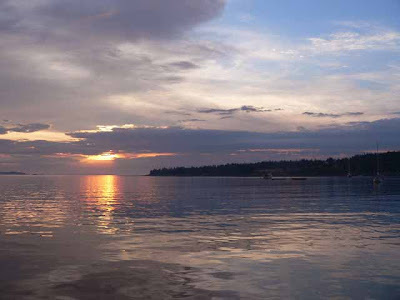 The sky was overcast but the clouds parted long enough for Ann to take a sunrise photo. There were threatening clouds from the cold front that came through last night so we weighed anchor and motored towards Rockland. 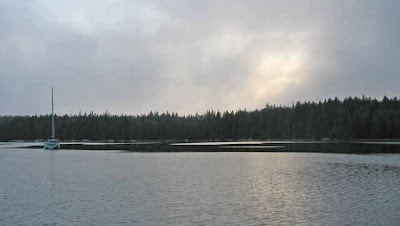 Once through the Fox Island Thorofare we could see Rockland in the distance backed by a dark cloud bank. Looking at the radar, we could see the rain approaching but we had the enclosure installed so as the rain started, we stayed dry. However, coming to our marina where we had a dock, it was time for full rain gear for me as Ann docked the boat. The Mehaffeys arrived later and we went to Camden for shopping and dinner at Peter Ott's which was very good. The rain had stopped by late afternoon but the evening had turned much cooler. The Smiling Cow had a porch overlooking Camden harbor which I used for a photo op. We're headed for Seal Cove that's without internet coverage so we'll be out of touch for awhile again but Spot will still give our positions as we sail for those interested. 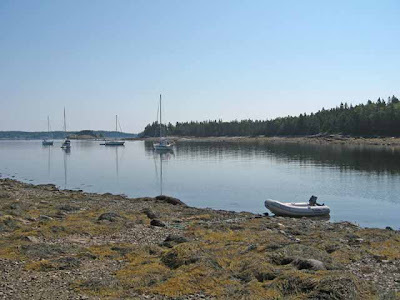 It was another cloudless day with wind in Maine, warm too. The wind was out of the west so we motored to Billings Marine to refuel and refill with water. They have good water but we still put it through the carbon filter on the way to the tanks. For drinking water, we use water out of the tanks after further filtration through a Seagull filter advertised to even remove bacteria. It's better than bottled water. 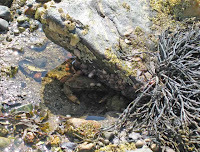 In this particular part of the bay, the currents are such that the lobster pots with their toggles lie at right angles to our path of travel so you have to be particularly careful in avoiding them. The toggles can be up to 60 to 80 feet from their buoy with the line connecting them stretched taunt, depending upon the current. If you go between them, you'll catch the line on your rudder. We've caught several but they've always come off so far. Our prop is the folding type so at least when we're sailing, it's folded out of the way. Once clear of Billings Marine, we set sail for Carver Cove with a steady southwest wind of around 10 kts. There were at least a dozen sailboats out enjoying the weather, just beautiful. Winds up to 20 kts are predicted for tonight out of the southwest but Carver Cove is protected very well from that direction. Tomorrow we head for Rockland to pick up the Mehaffeys. Since the Bunches were leaving today, the sun came up and warmed the cockpit in a cloudless, blue sky! On top of that we had a 10 to 15 kt west wind with no fog, perfect for sailing. 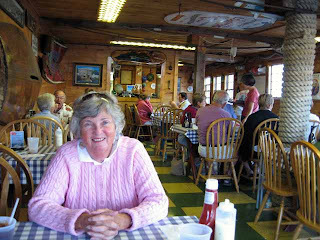 Ann had a send-away breakfast of blueberry pancakes and Don and Liz headed south to their next vacation at Kennebunk (never too many vacations...) before the next one after that on a barge in Europe. 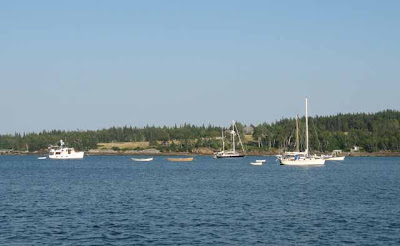 After another load of wash and restocking with groceries, we set sail for Mackerel Cove. The air was warm and the winds steady as we tacked back and forth towards our anchorage. I might add that the lobster pots were thick in that area and we hooked a couple but they slid off the rudder without a problem. We don't have a wing keel like on our old boat the Ericson which used to hook pots and not let go. Everybody must have heard about the west winds since our anchorage had half a dozen boats present but there's lots of room and we still had our favorite spot open, way in. It's peaceful now with 6 kt winds. 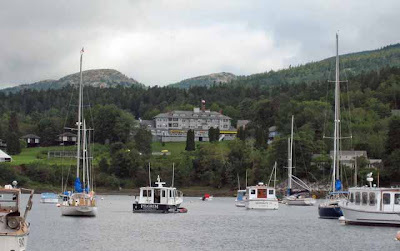 We'll head further west tomorrow to Carver Cove to prepare to the arrival of the Mehaffeys on Tuesday. 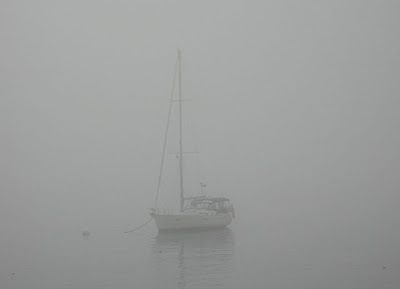 We awoke to a deep fog, we couldn't even see the neighboring boats - and then it rained. We spent the morning playing bridge with the Bunches with Don continuing his streak of corralling all the high cards. Objectively I know that cards have no memory and that every hand is independent of previous hands as far as point count is concerned but it sure doesn't seem that way subjectively. At any rate we continued to provide a forum for Don to show off his aptitude for collecting aces, kings and queens. 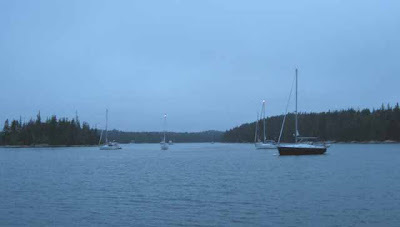 At least the rain cleared the fog out so we weighed anchor and headed for Bass Harbor. 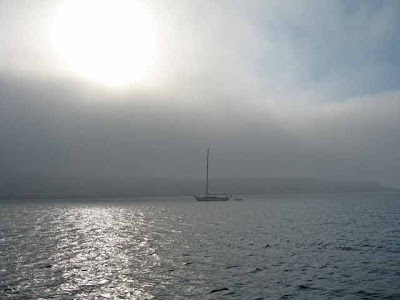 We had intended to pick up a mooring in Southwest Harbor but the fog banks we saw in that direction discouraged us from that endeavor. 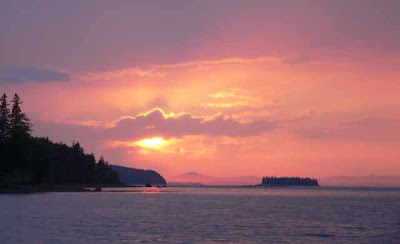 Bass Harbor is on the west side of Mt. Desert and out of the fog, so far. Off we headed across the bay and picked up a Morris Yachts mooring just as the fog returned! LL Bean sponsors a free trolley that goes all over Mt Desert with one stop being Southwest Harbor where the Bunches had parked so they could retrieve their car. It was time for our once a week grocery and laundry run after which the Bunches offered to take us out to dinner. Looking at the fog I decided to take along a GPS and leave the lights on our boat even though we were only 500 feet off the docks, better safe than sorry I thought. It was still light after dinner but growing darker. Returning to Morris Yachts, we couldn't see our boat! I turned on our GPS where I had stored a waypoint to mark the location of our boat. Ann held the GPS and pointed in the direction it indicated as we headed out into the thickening fog. We finally saw our boat when we got within 50 feet, good thing we had our GPS! We're supposed to have a west wind tomorrow according to the Evening Lies. More rounds of bridge ended the evening (Don continued to enjoy his cards) and after totalling the results the home team conceded. Oh well, there's always next year. The morning was foggy but the sun came out and gave a beautiful cast to everything. The water was perfectly still and gave a mirror image to everything in it. The windjammer next door was reflected so well that when we took the photo it was not apparent which side was the real up. Slowly the fog dissipated and we headed east to Opechee via Eggemoggin Reach. The sun was full in the sky as the fog disappeared and we were in shirt sleeves, it was warm in the cockpit. As we exited the Reach, we put up sails for the rest of the trip to the anchorage. The lobster pots were interesting since the current was at right angles to our path so the line between a lobster buoy and its toggle was strung across our bow like the chain across the Hudson in colonial time to keep out the British. Some of the lines were 30 to 50 feet long and you had to be careful to pass them down-current or you would be swept into the "trap". I managed to find one buoy which we drug for about 100 feet but it finally came off (whew!) When I passed closer than I intended to a buoy, I had to "bend" around it as the current swept me into it. One time as I successfully executed the maneuver, winding up 90 degrees to my previous path as I "bent", a lobster boat came up directly behind me to service the buoy, it belonged to him. It would have been very embarrassing to hook the buoy right in front of the owner! The morning was foggy but it retreated as the sun rose in the sky. After a blueberry pancake breakfast, we headed out. There was enough wind for a lazy sail pointing south. The fog returned but we didn't mind as long as we could sail. With the radar, we could always tell when another boat was nearby and as it turned out we were out in the fog by ourselves except for the occasional lobster boat. As the day worn on, the fog gradually lifted. 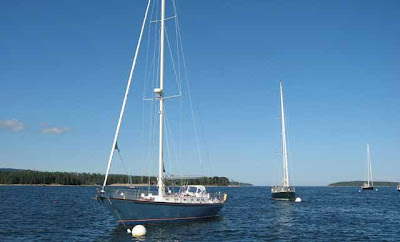 We sailed on to Northwest Harbor on the west shore of Deer Island. It's not a popular anchorage so we thought we would have it all to ourselves. However, a windjammer sailed in too and anchored right next to us! On the water, boats appear a lot closer than they really are. 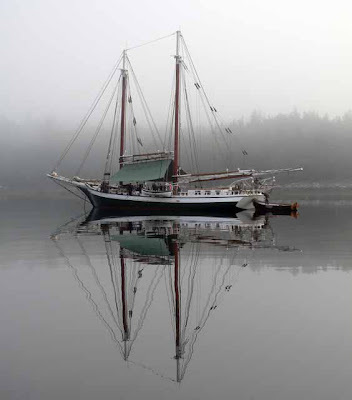 The windjammer appeared to be on our doorstep. Among our crew, the estimates ranged from 100 feet to 200 feet for the distance to our new neighbor. Having done this before, I estimated 200 feet but several of the crew thought 100 was more realistic. With the radar as our measuring tool, the windjammer was actually 210 feet away! Ann and I have seen this effect in our previous anchorage. Looking from your boat, the other boats appear to be too close. When in a dink and looking at both boats from the side, it's apparent that the distance is much further than it appeared to be from the vantage point of your own boat. The harbor faces northwest (surprise..) and has great views of the setting sun, Ann snapped this photo. At last the sun! We awoke to glorious sunshine and we celebrated with breakfast in the warm, sunlit cockpit. The wind was predicted to be out of the west which would be perfect for a broad reach north but as we pulled out of the bay, the wind direction was from the southeast! The Morning Lies broadcast once again earned its name. However, we still made our way north and the sun was full in the cockpit as we enjoyed the sparkling views of the surrounding islands. In all we sailed north for over 20 miles - we used no fossil fuels, a "low carbon footprint" day! 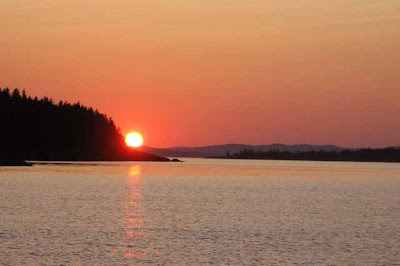 We anchored at Holbrook Island harbor which is in the northern part of Penobscot Bay. Generally, it's warmer and has less fog than the lower part of the bay since it's surrounded on three sides by land. 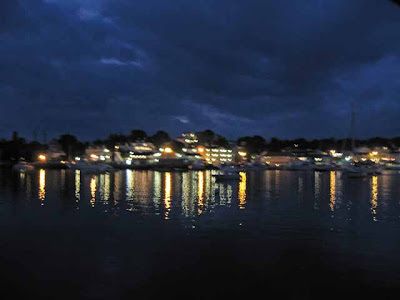 The harbor is protected on all sides, a great place for a storm. Ann added to her collection of sunset photos, she does a good job at it. It rained all last night and all morning. 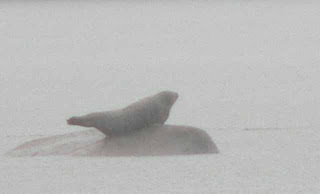 The seals still came out to "sun" themselves on the rocks but all they got was rain! The rain finally abated by mid afternoon but it was still overcast with no wind. The Afternoon Lies predicts wind out of the west tonight of 10 to 15 with gusts to 20kts! I'll believe it when I see it. Since they are predicted to come too late for us to sail by, they are probably right this time! The bad weather prompted a morning of bridge playing, adding to the "Maine Fog Championships" scoring. At least we are eating well. We'll have a roast pork tonight with all the trimmings with wine and cheese on the back of the boat. The side curtains we had made this year work wonderfully in keeping the cockpit dry and warm. With winds out of the west predicted for tomorrow (ha!) 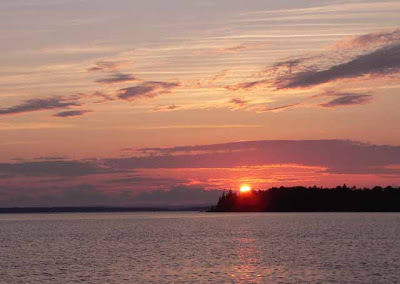 we'll sail north in Penobscot Bay, a broad reach direction, we'll see. passage was uneventful and although there were about 10 boats already in the inner harbor, there was still plenty of room for another boat. After we had been anchored for an hour or so, another boat anchored nearby and the captain came over and asked if we thought he was too close - and offered to reanchor if we thought they were! It's the first time that's ever happened to us. We turned on the radar to measure the distance to his boat which was 210 feet, plenty far enough away but it was nice of him to ask. The heavens then opened up and it poured! It continued all through the night with me opening and shutting the hatch over our bed on cue when I heard the rain. On Sunday they had predicted today to be clear with a southwest wind (a clearing direction) but the weatherman lied. We refer to the morning NOAA weather report as the "Morning Lies" followed in the afternoon by the "Afternoon Lies". You're better off just looking up at the sky to see what it's doing. In fact, my weather station on board which uses nothing more sophisticated than it's internal barometer is currently predicting rain which I believe more than NOAA. Meanwhile we are having the "Maine Fog Championships" on-board playing bridge and having fun with the bridge, watching it rain (! ), and reading. We may well stay here tomorrow too if the weather doesn't clear. Much to our surprise we awoke to sunshine! What a difference a little sun makes! We only had 2.5 miles to go to Southwest Harbor where Richard had his car. He had an 8 hour drive ahead of him so we got off in good season from Northeast. Ann did her thing with blueberry pancakes and we docked at Hinckley's to take on water, fuel, ice and dispensing with garbage. I complete my electrical modifications with an addition of another Echo Charger, this one for the genset battery so now everything is automatic for charging both the diesel and genset batteries. Don and Liz Bunch arrived around 5:30 and we headed over to Beal's Lobster Pound for a taste of Maine lobster, hard to beat! After two dinghy trips, everything was aboard and we're settled for the night. Tomorrow we sail! 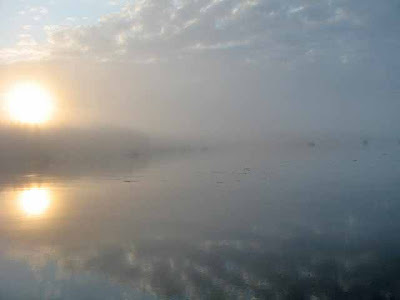 The sun came up in Mackerel Cove but it was only a teaser, the fog followed shortly, especially as we neared Mt Desert. I had started the genset to warm the cabin from the 55F temperatures but as we motored to Northeast Harbor, we were bundled up again but the enclosure did help keep the worst of the cold at bay, There were two flotillas due in Northeast so we were a little concerned about getting a mooring and as it turned out, we got the last one at 11:30 am! It rained most of the day, not good for exploring the area. 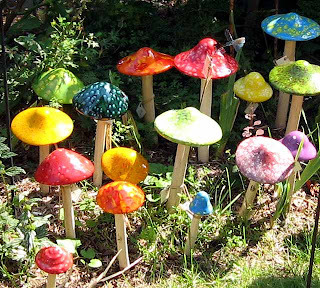 We had wanted to dink over to Asticou Gardens but it was not to be with all the rain, maybe next time. However, I did get the blog updated and conducted a lot of business over the internet. Maine has turned cold. It rained during the night and this morning it was gray and overcast. We started out after breakfast with the side panels on which sure keeps the cockpit warmer in the colder weather. I wish we had the enclosure for our overnighter last year, it would have made the sessions at the wheel much easier to endure. We headed down Eggemoggin Reach and encountered more rain but made it to Mackerel Cove by noon. The sun came out briefly, enough to warm the cockpit via a solar heating effect through the plastic so we set out in the dink to take advantage while it lasted. We dinked over to the ferry landing with the intention of seeing the museum but learned that it had burned down a couple of weeks ago from a lightning strike! We did see the ferry from Mt Desert come in (photo). Oh well, we returned to the dink and just went sight-seeing along the shore. It's currently 58F at 8:15 pm (update, 55F in the morning! ), much cooler than our experience in July, hopefully it will warm up for the Bunches and the Mehaffeys. 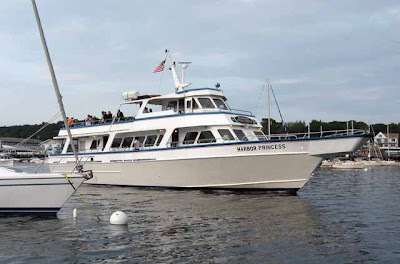 Tomorrow we head for Northeast Harbor and a going away dinner for Richard.